Rich Tool Systems stocks quality Black Nitrile Gloves. 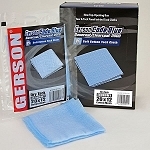 Gloves are puncture resistant, hide dirt, grease and grime. Great for mechanics, industrial workers, homeland security.